Powdered metal bearings (SAE 841) are used in applications that call for completely wear-resistant components. Self-lubricating powdered metal bronze bushings are made by blending powders, shaping the mixture into the required sizes, and heating it in oven to bond the particles. The next step in the process is to size the bronze bushing; this involves placing the material back into the dye and press it into the finished shape. The next step in the process is to oil-impregnate the metal bronze bushing for lubrication or corrosive resistance. This creates a fantastic cost efficient bearing. Operation temperatures range from 10* F to 220*F. Shipped in plastic bag to preserve the oil. We offer many sizes in this section, in inch dimensions sleeved and sleeved with flanges. 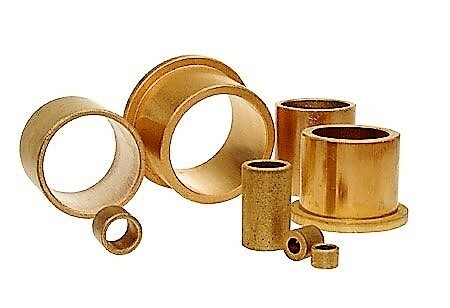 Metric bronze bushings are also available upon request. SAE 841—also called Oilite®, this bushing starts as powdered metal and is then sintered and impregnated with roughly 19% SAE 30 oil. The oil reduces wear as well as providing lubricant. This version has a flange. If you don't see your sizes Contact Us.